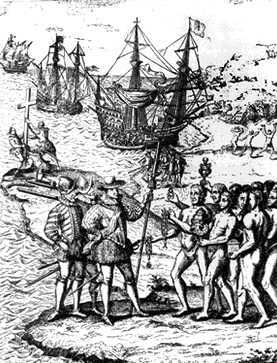 This Theodore DeBry engraving shows the first encounter between Europeans and Taínos, the indigenous population of the Caribbean, on the island of Hispaniola (later the Dominican Republic). The engraving consists of a series of trinities. Columbus’s three ships hug the coast in the background, while in the foreground three groups of people are shown. At the far left, three Spaniards struggle to raise a cross. Next to them, a second group of three Spaniards confronts a group of Taínos. These indigenous people are shown in a somewhat idealized manner as they present exotic gifts to men who will be their future slavemasters. The repetition of threes–an important number in Christianity–gives the scene religious resonances that suggest a desire to portray Columbus’s arrival as a kind of apocalypse.